Today is Veteran’s Day, and that means AWS wants to offer one more heartfelt salute to all of our active and retired service men and women. Along with that salute, we want to tell you about one more way that the industry is striving to help our veterans get back in the workforce through welding and manufacturing. The program is Workshops for Warriors, founded by U.S. Navy Veteran Hernan Luis y Prado to assist the transition of veterans and injured veterans into civilian life through training, mentoring and job placement. Workshops for Warriors boasts 140 graduates, 49 currently enrolled veterans and a job placement rate of 100% since 2011. Training consists of a combination of classroom education, vocational training, and practical work experience that empowers veterans and increases their career options; and that training comes at no cost to veterans. The program is funded through from manufacturing corporations, private foundations, bank donations and other private donors. In 2013, Workshops for Warriors founder Hernán Luis y Prado was recognized by the White House as a “Champion of Change” for his organization’s extensive work and achievements to transition military veterans into advanced manufacturing careers. The program’s slogan, “We are rebuilding America’s advanced manufacturing workforce, one veteran at a time” is a literal description of its mission. That mission began with a retired naval officer named Hernan Luis y Prado. Luis y Prado served four combat tours in Iraq and Afghanistan and is a graduate of the Navy Surface Warfare Officer School, where he completed the Chief Engineering Officer and Combat Systems Officer curricula. After returning to civilian life, Prado noticed how many of his comrades were failing to transition into their own post-service existence. Compassion for his fellow veterans prompted him to found Workshop for Warriors in his garage back in 2008. The program has since grown into a ½ acre campus. And now Workshops for Warriors is working with AWS to become a SENSE school and an official AWS Accredited Testing Facility (ATF). The AWS SENSE program is a comprehensive set of minimum Standards and Guidelines for Welding Education programs. SENSE guidelines include uniform competencies, testing, and welding procedures, consistent with SENSE programs nationwide. SENSE schools are also more eligible to receive Perkins funding. The AWS Accredited Test Facility program establishes minimum requirements for test facilities, their personnel, and equipment to qualify for accreditation to test and qualify welders. As an AWS Accredited Test Facility, Workshops for Warriors will be able to offer their graduates standardized welding credentials that are recognized nationwide. In fact, both the SENSE and ATF programs make welding credentials portable an easy to access. Currently, Workshops for Warriors offers two primary tracks – welding and machining. Semesters last four months and successful participants can earn credentials from the American Welding Society, the National Institute of Metalworking Skills, Mastercam University, Immerse to Learn and OSHA. Dennis Chambers, USMC (ret.) 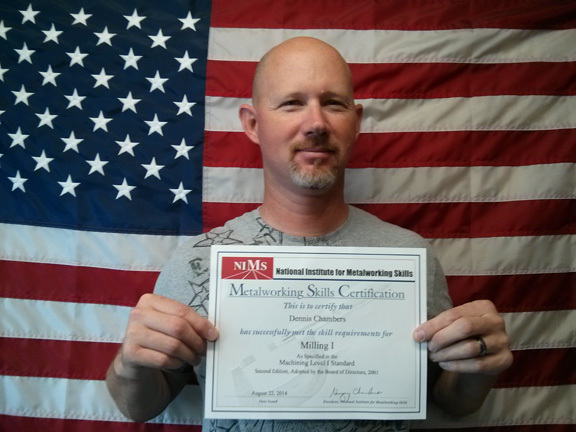 holds up one of four metalworking certifications he has earned through the Workshops for Warriors program. The real-world experience provided by the program will enable Dennis to choose from a variety of jobs. Students who finish a complete 4-semester program can move on to advanced-level training in either of the two tracks. A single semester with Workshops for Warriors results in job placement at a livable wage. However, after the advanced track, the program offers job placement at annual entry-level salaries of $50,000 and higher. If you’d like to learn more about Workshops for Warriors, including how to apply, visit their website at http://www.workshopsforwarriors.com. And if you’d like to learn more about the SENSE and ATF programs, simply click on theses links. For online lectures, virtual conferences, a link to our YouTube channel and more digital tools to help you advance your welding career visit American Welding Online. Happy Veterans Day to all of our service men and women, active and retired. Im interested in workshops for warriors, and already have some welding skills and my CDL A.